Lisa and Lisa return from a lovely six week reading haitus to talk books and the theme this time is food. Why food? Well, Lisa LC is wrapping up a summer with the crepe cart at Vermont and New Hampshire farmers’ markets and J Lisa C has enjoyed bringing her kids to the cart for dinners of buckwheat crepes with delicious fillings. In addition, both Lisas are heavily involved in organizing BookFeast: read it and eat, a series of events sponsored by the Norwich Public library to get people thinking about books, reading, food and community. 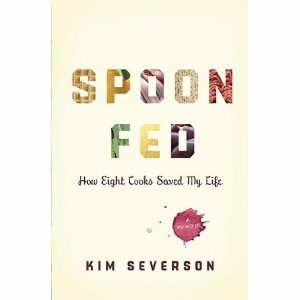 Spoon Fed: how eight cooks saved my life by Kim Severson — With this frank memoir, Severson, takes the reader from Alaska to San Francisco and New York and always back home to the midwest of her childhood. She covers topics as diverse as overcoming her destructive habit of excessive drinking, Italian American kitchens, coming out as a lesbian, and finding love and then motherhood and more love. She manages to write about herself without seeming self obsessed and it was refreshing to see her mother included with the more famous Marion Cunningham, Ruth Reichel, Alice Waters and others she discusses. We both enjoyed meeting the challenging, funky, honest person contained in these pages. The Particular Sadness of Lemon Cake: A Novel by Aimee Bender – Lisa LC discusses the magical realism threading in this tale of familial neuroses. The main character can literally taste the emotions of whomever prepares her food, giving her unwanted insight into other people’s secrets. Bittersweet and not terrific all the way through, this novel is worth looking at, especially in combination with the pick J Lisa C brings to today’s show. Bitter in the Mouth by Monique Truong – J Lisa C LOVED this novel. Seriously LOVED all the aspects — the southern setting, the main character and her unique speech affliction, her beloved great uncle, the changing relationship with her best friend and her mother, her descriptions of both the mundane and profound aspects of life — work together for a truly, truly enjoyable read. She is truly sad she can never read it again for the first time. We will leave food behind for books about Pakistan and Iceland and possibly politics. (Why? Stay tuned for the next shows.) In the meantime, for additional information about Norwich’s October and November BookFeast: read it and eat, please visit www.norwichpubliclibrary.org.